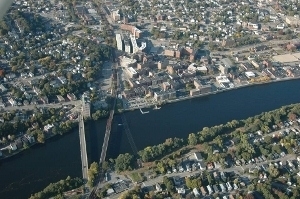 The Chamber serves 13 towns that surround the City of Haverhill, MA. Eight of our surrounding towns are in New Hampshire, and are somewhat rural, as are the 5 other towns we serve in Massachusetts. The area is largely middle/upper middle class, with the exception of the inner city area of Haverhill. There is plenty to do in the area. Haverhill alone has 6 golf courses, a ski area, 3 marinas, trains that connect from Boston, MA to Portland, ME, loads of trails, shopping, beaches (fresh and sea) and great restaurants. Includes Cities/Towns: Haverhill, Methuen, North Andover. Haverhill boasts many recreational opportunities, year round. Celebrate spring while you improve your swing on one of Haverhill's four 18-hole golf courses. Dive into summer's cool waters or learn to sail at Lake Saltonstall. Hike trails along the Merrimack River on a crisp fall day as Nature dazzles you with red, orange, and yellow leaves against a clear blue New England sky. Schuss down the slopes on skis or snowboard under the bright winter sun at a local ski area. beautiful trails at Winnekenni Basin and Recreational Area. Haverhill's strong sense of community spirit is clearly heard from the spectators at baseball, softball, soccer and football games played on the many well-manicured fields across the city. Move indoors and you'll see people from throughout Greater Haverhill working out at Cedardale Health & Fitness, the largest indoor-outdoor athletic club in New England, perfecting "figure eights" at the roller and ice skating rinks or enjoying a championship game of bowling. Jan 15.0 F° 25.0 F° 35.0 F° 4.2 "
Feb 18.0 F° 28.0 F° 38.0 F° 4.1 "
Mar 26.5 F° 36.3 F° 46.0 F° 4.9 "
Apr 36.0 F° 46.8 F° 57.5 F° 4.5 "
May 46.0 F° 57.3 F° 68.5 F° 4.3 "
Jun 55.5 F° 66.5 F° 77.5 F° 4.0 "
Jul 61.5 F° 72.3 F° 83.0 F° 3.8 "
Aug 60.0 F° 70.8 F° 81.5 F° 3.7 "
Sep 52.0 F° 62.8 F° 73.5 F° 4.0 "
Oct 40.0 F° 51.0 F° 62.0 F° 4.6 "
Nov 31.0 F° 41.3 F° 51.5 F° 4.4 "
Dec 22.0 F° 31.3 F° 40.5 F° 4.5 "
There are many, many volunteer opportunities to be had from all manner of organizations. There are also many service and part time jobs available in a variety of industries.